It's Thursday 12:46 PM — We're open. We do our best to offer high quality Chinese food as well as satisfactory service for our customers. You can order food online for pick up or delivery. Browser our menu. Golden Wok offers delicious dining and carry out to Bradenton, FL. 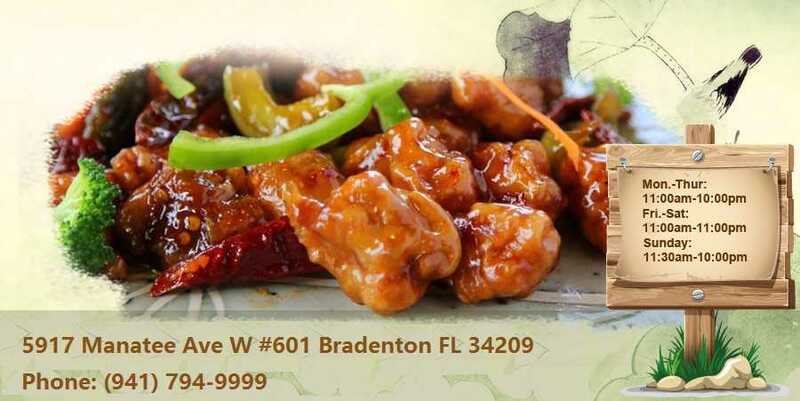 Golden Wok is a cornerstone in the Bradenton community and has been recognized for its outstanding Chinese cuisine, excellent service and friendly staff. Our Chinese restaurant is known for its modern interpretation of classic dishes and its insistence on only using high quality fresh ingredients. Enjoy your delicious Chinese meals. At restaurant Golden Wok we offer meals of excellent quality and invite you to try our delicious food. Eat delicious food. Grab a drink. But most of all, relax! We thank you from the bottom of our hearts for your continued support. Thank you. Online ordering NOW enabled for pick-up or delivery. Just tell us what you want and we’ll prepare it as fast as we can. Copyright 2019 © Golden Wok Chinese Restaurant. All Rights Reserved.